"(...) Count Adolf started building the castle of Segeberg and fortified it. Because the land was ravaged, he sent messengers to many regions, namely to Flanders, Holland, Utrecht, Westphalia and Frisia, with a message that if they needed more land they were free to come with their families, and they would be given a lot of good fertile land, full of fish and game, rich in vast pastures. He also told Holsatians and Sturmarians: 'Aren't you the ones who conquered Slavic land and obtained it through deaths of your brothers and relatives? So why should you settle as the last ones? Be first, start migrating to this desired land, settle it and benefit from its resources' (...). After that call, huge crowds of people from various nations started coming, together with their families and property, to the land of the Wagrians ruled by Adolf, who promised to give them land. Holsatians were given safe areas to the west of Segeberg, near the Trave river, including the Zuentineveld [modern Bornhöved] fields as well as everything between the river Schwale up to Agrimesov [modern Grimmeisberg] and up to Lake Plön. The region of Dargun [modern Warder and Ahrensbök/Stoob] was settled by Westphalians. The region of Utyn [Eutin] was settled by Hollanders. 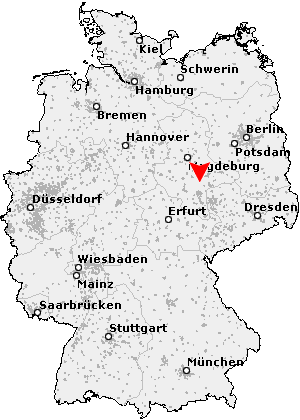 The region of Süsel [south-east of Eutin] was settled by Frisians. The region of Plön still remained depopulated for the time being. 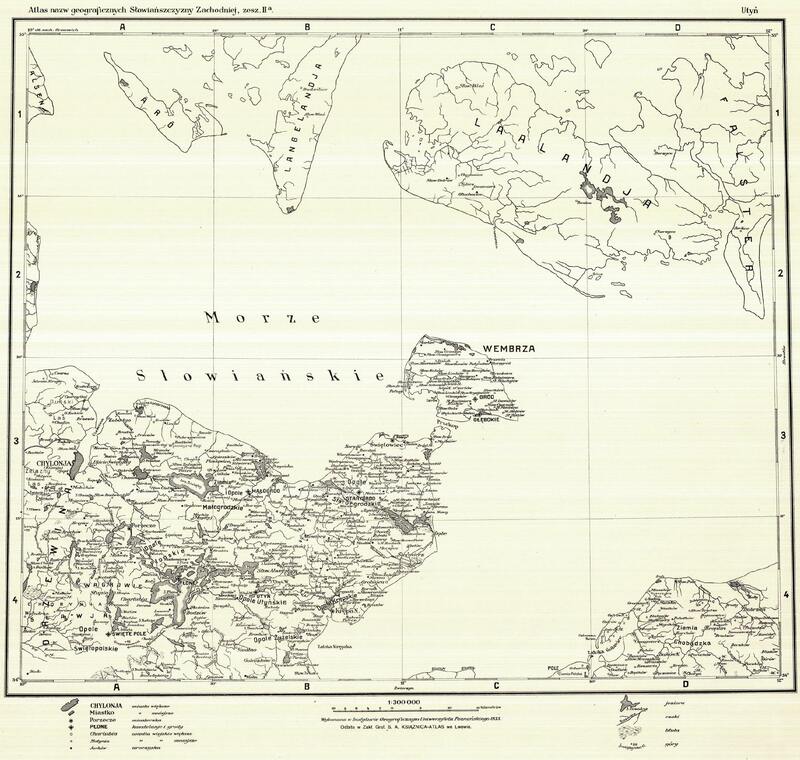 Regions of Starogard [Oldenburg] and Lutjenburg as well as other areas along the sea coast were left for farming to the Slavs, who now had to pay rent to Count Adolf (...)". "Heinrich, Count of Ratzeburg in the land of Polabian Slavs, brought masses of Westphalian settlers, in order for them to settle in the land of the Slavs. And he divided the land between them. And they built churches, and they started paying taxes from their farming income for the Glory of God. And God's deed started to spread throughout the land of the Slavs under Heinrich's reign, and was completed during the reign of his son, Bernard. On the other hand, Holsatians who settled in Wagria after expulsion of local Slavs, were very zealous when it comes to building new churches, and were very hospitable, but they avoided paying taxes. (...)"
"At that time Slavic lands were ruled by Margrave Albrecht, also known as the Bear, who - thanks to God's grace - managed to conquer large Slavic territories. He captured entire land of Stodoranians, Brezans and many other tribes living at the Elbe and Havel rivers. And he was crushing those of them who were trying to rebel against his rule. When decimated Slavs started to slowly disappear, Albrecht sent messangers to Utrecht and to lands along the Rhine river and also to those who lived along the ocean's coast and suffered a lot from violent storms of the sea - namely Hollanders, Zealanders and Flemish people - and he brought many settlers from among them, and he settled them within Slavic towns and villages. Thanks to that colonization by foreigners, the Bishopric of Brandenburg and Havelberg increased its strength, because the number of churches and tax income increased. 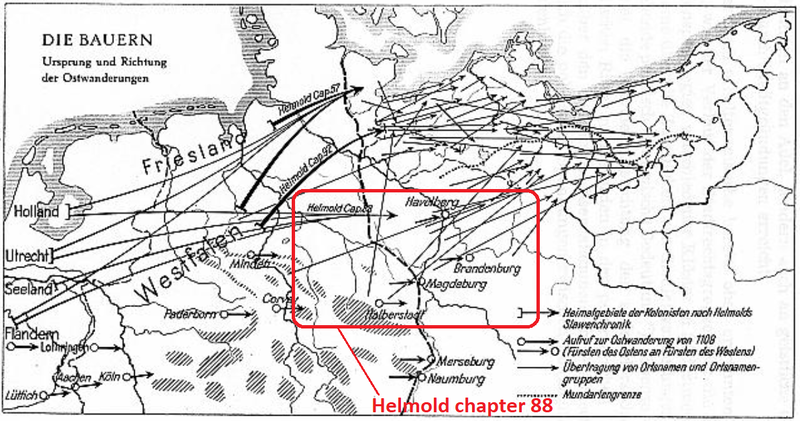 But also southern banks of the Elbe river were at that time colonized by Dutch newcomers, they settled lands around Salzwedel, and Balsemerland [around Stendal and Halberstadt], and Marscinerland [between Arneburg and Werben], with many towns and villages, extending as far as the Bohemian Forest. (...)"
Last edited by Tomenable; 01-26-2019 at 01:49 PM. So when Germans in Central & Eastern Germany score e.g. "Dutch" or "Belgian" DNA, it is not a mistake - they really came from there. If they score e.g. "Dutch + Ukrainian", it means they are partly descended from local Wends or Sorbs, and partly from Dutch settlers. Last edited by Tomenable; 01-26-2019 at 01:59 PM. According to Helmold's "Slavic Chronicle" ("Chronica Slavorum") after the conquest of Wagria by crusaders, Slavic inhabitants (the tribe of Wagrians) were relocated to a reserve around Oldenburg and Lütjenburg, where a church with sermons in Slavic was established for them. Another church with sermons in German was built in Ratekau. Last edited by Tomenable; 01-27-2019 at 06:44 AM. Where they up to now endogamous Tomenable? This is an area with lots of booby traps, with ideological convictions, especially with older sources....(before '45). 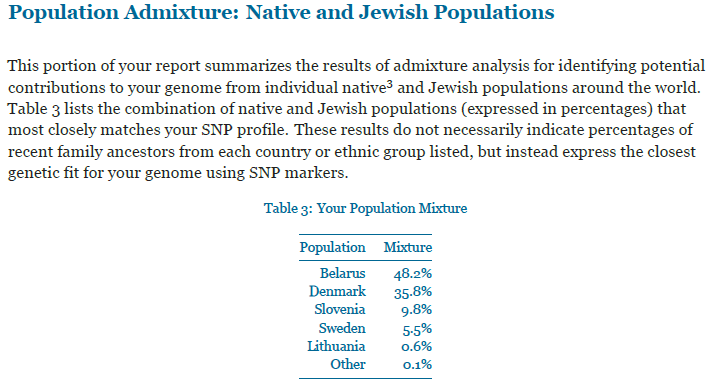 Well, I am of the opinion that modern East Germans there, were "created" when Dutch-like (genetically) people mixed with Sorbian-like Slavic inhabitants. What about South Germans? Are you aware that almost all of Early Medieval samples from Bavaria and Swabia - except for the ones with deformed skulls and "Mediterranean" (Non-Celto-Germanic) genetics - cluster with modern Danes and Dutch (especially Dutch Frisians), not with modern Germans (let alone with modern South Germans!). In my opinion it could be caused either by population replacement (after Charlemagne's conquest, new settlers from Francia) or mixing with "Celts". 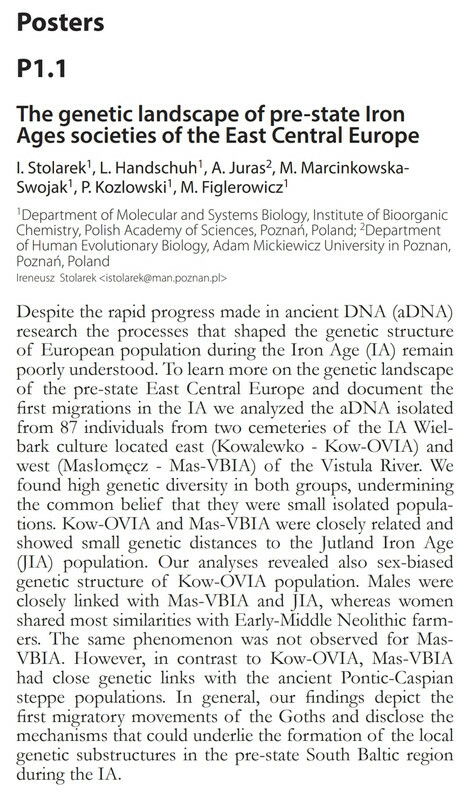 But these "genetic Celts" should be there before, so why didn't we find them among the genotyped Early Medieval samples from Bavaria, Swabia? Surely women with deformed skulls were not Celts, and were not even locals (as strontium isotopes show), but were likely imported Dacian/Thracian/Illyrian/Greek/Italian wifes. Individuals from Early Medieval South Germany who do not cluster with modern Danes & Dutch, usually plot close to Romanians, Serbs, Italians, Greeks. It seems that conquest of Pagan Germanic tribes (such as Saxons) by Charlemagne's Empire, was associated with large west>east population movements. We actually have written sources which say about massacres of Saxons and forced deportation of several thousand Saxon families from Nordalbingia to Gaul (Francia). ^^^ After those dramatic events, who knows, maybe even more of Saxon DNA survives in modern England, than in original Saxony? I wouldn't also be surprised if a lot of Gallo-Romans, Latin-speakers, came to Bavaria etc. after Charlemagne, but later language shift to German took place. Last edited by Tomenable; 01-27-2019 at 09:29 AM. My analysis just reflects the observations of many people for many years (questions like "Why German DNA does not show on DNA tests?"). Of course you can artificially force the algorithm to show German results by applying penalization... but that is "cheating", kind of. And I explained why many Germans may score Dutch + Slavic instead of German: because they really are Dutch/Danish + Slavic or Dutch/Danish + Celtic. Simple as that. Even those Early Medieval German genomes from Bavaria and Swabia (Alemanni) were genetically Danish or Dutch (especially Dutch Frisian). If you think there is "magical continuity" between Bronze Age Tollense and modern East Germans, you are most likely wrong - too many sweeping migrations in-between. I remember when they discovered that Corded Ware from Eulau were R1a, people were claiming "so modern R1a in Germans is Corded Ware, not Slavic". 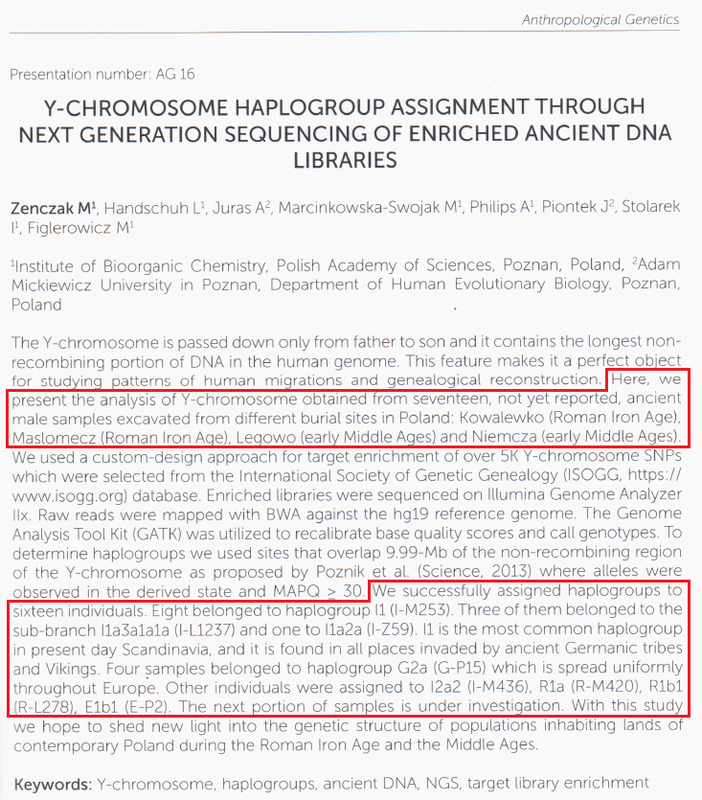 Turned out to be wrong because subclades are completely different and that R1a from Eulau is pretty much extinct today (except for small pockets in Western Europe). BTW, Eulau cemetery contains burials of victims of cannibalism - those R1a people were the victims. Explains why this subclade got extinct! Sure, Western Lower Saxony is pretty close genetically to Denmark and the Netherlands. Original Saxons were similar to Frisians, Danes and Dutch. Last edited by Tomenable; 01-27-2019 at 09:31 AM. May be the case. A more recent event is the depopulation in the Thirty Years War, after which often Swiss migrated to SW Germany. 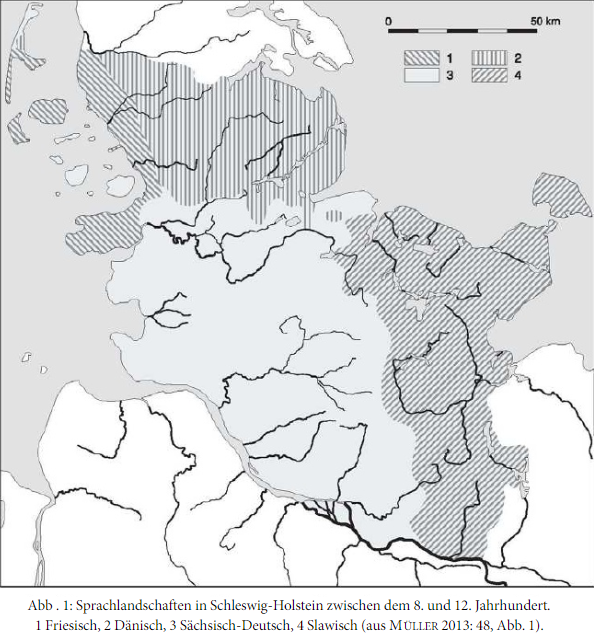 So in 300s-400s AD, Saxony-Anhalt probably had Y-DNA frequencies more similar to modern Sweden than to modern Western Germany. 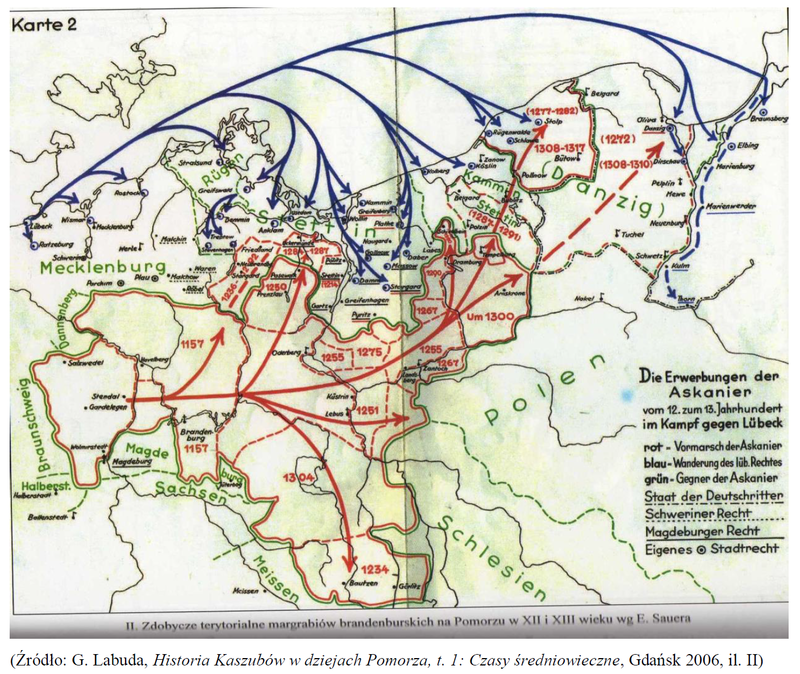 I suggested that R1b-U106 expanded from more western areas into what is now Central and East Germany after 800 AD. Last edited by Tomenable; 01-27-2019 at 10:07 AM. I wouldn't be surprised if a lot of Gallo-Romans, Latin-speakers, came to Bavaria, Swabia after Charlemagne, but later language shift to German took place. Last edited by alexfritz; 01-27-2019 at 10:06 AM. 'Barbarian' split: Celts and Germans! ?